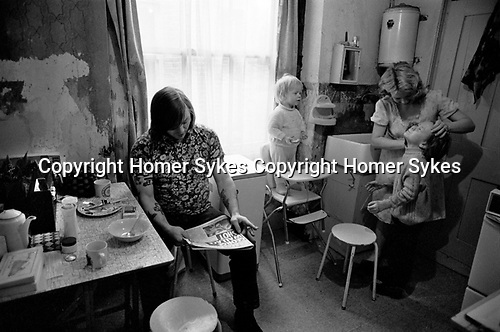 A working class family have just finished breakfast, this is their kitchen. The boy is having his face washed in the butler kitchen sink. They don’t have their own bathroom which is shared with other families in the multi occupancy house. The kitchen table is not big enough for everyone to sit around. Mother uses the small pull down sideboard on extreme right when they all eat together. Both parents are in work, the father is a jobbing builder and the mother a char for wealthy families in Chelsea.